Oscars Winners For Best Picture. Jane Marryot: [as the Marryots return home from an outing] Thank you Bridges. Robert Marryot: Everything ready Bridges? Jane Marryot: Thought we should never get here in time. I'm sure that cabby was tipsy Robert. Robert Marryot: So am I; he called me his old coccolare. Jane Marryot: Oh, what did you say? Robert Marryot: Gave him another shilling. I enjoyed this film, not so much as a piece of entertainment that still holds up today, but as a moment frozen both in time and geography. 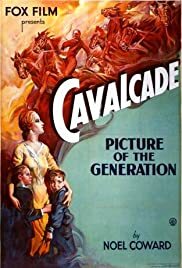 Unlike "42nd Street" and "Dinner at Eight" which are other films from 1933 that I think most Americans would find very accessible today, you might not care for Cavalcade if you don't know what to look for. This film is totally British in its perspective and it is also very much in the anti-war spirit that pervaded movies between 1925 and 1935 as WWI came to be seen by nearly all its global participants as a pointless war and caused everyone to lose their taste for fighting another. The British perspective that you have to realize is that the Marryotts are accustomed to being on top - both in the world as England had dominated the globe for centuries, and socially, as they were part of the aristocracy. That didn't mean that they were snobs - they were very friendly and compassionate with their servants. But the point is, they were accustomed to the relationship being their choice and under their control. Suddenly England appears to be on the decline on the world stage and the servants they were so kind to are coming up in the world on their own and don't need their permission to enter society. Downstairs is coming upstairs, like it or not. Downstairs is personified in this film by the Bridges family, Marryot servants that eventually strike out on their own and into business. Eventually the daughter, Fanny, enters into a romance with the Marryot's younger son. When Mrs. Marryot learns the news she is not so shocked as she is resigned to the fact that this is another sign that her world is slipping away. As for Fanny Bridges, she seems to personify post-war decadence as she grows from a child to full womanhood in the roaring 20's. At one point in the film, as a child, she literally dances on the grave of a loved one. This is not a good sign of things to come. If the movie has a major flaw it is that it goes rather slowly through the years 1900 through 1918 and flies through the last fifteen years. Through a well-done montage you get a taste for what British life was like during that time - in many cases it looks like it was going through the same growing pains as American society during that same period - but it's only a taste. Overall I'd recommend it, but just realize that it is quite different in style from American films from that same year.